I just came back from the grand nation of England. Here, we encountered scary things such as hills and well-mannered rain. Also, there was some scary blue stuff in the sky following us around. As I came back, I saw a rather annoying post on Krauss his page. Now, I was also in the mood to make a blog post. Let's do this. Update: I've put a few updates throughout the article. Quite a few of the arguments are somewhat harder to rebuke, which is common for gish gallop. Somewhere in the end of 2015, a long blog post of mine should rebuke basically everything they have come up with. Update: The long blog post I announced in the previous update is here. 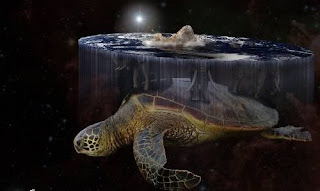 Rebuke: 10 Arguments For The Flat Earth And What It Has To Do With Spirituality A short look of the title tells us it's more of the click bait that pages with 'truth', 'spirit' and 'collective' usually bring us. Surprise.